At Doctorcall, we provided the first flu vaccinations in retailers in the UK and we have provided the templates for most of the major retailers to provide flu vaccinations. We subsequently invented the system of flu vouchers. 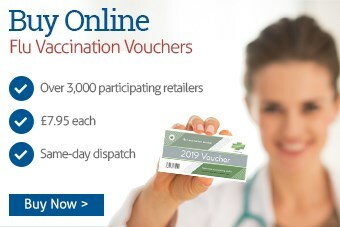 Staff who are unable to attend a vaccination day in the office can be given a voucher which they can redeem at any participating retailers such as Tesco pharmacies. Vouchers can be purchased in bulk for employees and are a simpler and more cost effective method of supplying your employees with a flu vaccination. In particular, field based staff or home based workers and transport companies may find a voucher an easier solution in obtaining a flu vaccination. There is nothing more to pay. Just present your voucher at the pharmacy to receive your flu vaccination. Our vouchers are recognised at the retailers whose service we recommend and they enable the employer to purchase vouchers for staff. Vouchers are the simplest and most cost-efficient way of offering vaccination to staff who are unable to attend on-site vaccination days. Redeemable at high street pharmacies. Order in advance to guarantee supply. Vouchers dispatched by 1st class post or Next day special delivery. Use this website to find your nearest participating pharmacy. Vaccine given by a fully qualified nurse or pharmacist. For more information and terms, please visit our voucher order page. We may be able to provide other vaccinations and immunisations other than flu jabs, call us today for details on costs and availability.